Milwaukie's volleyball team had a chance to jumble up the Northwest Oregon playoff picture Monday night, but was unable to hold on to its early leads and suffered a sweep at the hands of St. Helens. The opening set saw six lead changes and neither side was able to separate by more than a point or two. Milwaukie saw Alexis Thompson swing through early, but still manage to pop the ball off her knuckles for an attack that floated over the middle and dropped between a crowd of Lions. Teammate Alexa Perez followed with a service ace and the Mustangs would go in front 7-6. 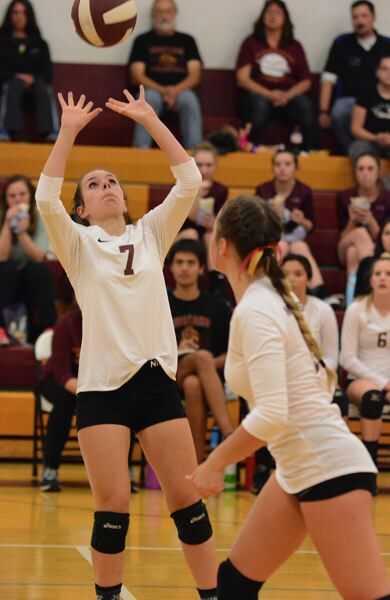 Milwaukie stayed in the mix midway through the set when Perez surprised the defense with a bump that made a low clearance over the net and spun down in the back row for a point. But St. Helens finished with a surge. Karlee Webster converted a tip shot to bring up set point, and setter Brea Paulson pulled off a dump shot to give the Lions the set 25-18 on their first opportunity. It appeared that Milwaukie would extend the match after building its biggest lead of the night at 10-3 early in the second set. Jannessa Jackson connected for three aces, and Katelyn England put down a pair of kills. England put a stuff block on St. Helen's hitter McKenna Miller to keep the Mustangs in command 14-8 midway through the set. Milwaukie even scored by accident on one brief volley. St. Helen's libero Karli Cupp blasted a serve down the middle that crashed into the upper arms of Milwaukie's Jessica Bolton. But instead of falling for an ace, the ball deflected to Jackson, punched it over the net where it fell between a pack of stunned Lions. But once again, St. Helens battled back late, claiming 11 of the last 14 points to take the set. The Lions moved in front when Cupp made a face-first dive along the sideline to keep the ball alive. Two attacks later, Webster pounded a winner off the Mustangs' block. "It was about keeping a positive attitude and just knowing where all the players are and where to place the ball," Cupp said. St. Helens setter Brea Paulson followed with a service ace, and the Lions claimed the set 25-21 when Savannah Moore to sent a big swing through the middle. The teams traded the lead nine times through the first two sets. St. Helens would blitz through the third set 25-5 to complete the sweep. Webster went cross court to bring up match point, and the night ended with Milwaukie putting a ball into the net. The Lions converted all three of their set points on their first opportunity. St. Helens ended a six-match losing streak to stay a step ahead of Scappoose in the chase for the league's last playoff spot. Milwaukie fell to 1-9 in league heading into Wednesday's 6:45 p.m. home match against Scappoose.